IT Pros HQ, October 11, 2016 — IT Pros is proud to announce that it has been named to the the FlexJobs 250: Top Companies for Flexible Jobs list. Based on an analysis of over 40,000 companies and their flexible job posting histories in FlexJobs’ database between October 1,2013 and October 1, 2016, IT Pros was ranked #78 for recruiting for the most flexible jobs. A “flexible job” is defined as a professional-level job that has a telecommuting, flexible schedule, part-time, or freelance component. “In a time when office space is glamorized or debates on whether or not an open office environment works or what kind of food and drinks should be in the kitchen office makes this particular award the reason employers need to think about their future when it comes to attracting and retaining talent”, says Founder & CEO of IT Pros, T. Brad Kielinski. IT Pros is a 100 percent distributed workforce providing technology staffing and recruitment services. “We use Asana, G Suite, FreshBooks, and Gusto to ensure our clients and teams are successful”, says Kielinski. We are excited to be named to this list and look forward to offering more flexible work options for driven-people in the United States”, Kielinski added. There has been significant growth in both the availability of flexible jobs in the past three years–FlexJobs experienced a 75 percent increase in the number of flexible jobs posted in its database–and in the awareness of why work flexibility is important. In fact, the creation of the FlexJobs 250 list is in honor of the three year anniversary of 1 Million for Work Flexibility, an advocacy initiative launched by FlexJobs’ founder Sara Sutton Fell to help encourage anyone who wants or needs work flexibility to easily show that they think flexible work options are important. • 80 percent of U.S. companies currently offer flexible work arrangements. • 89 percent of HR professionals say flexible work arrangements will be more prevalent in the next five years. • Since 2013, work-life balance, family, time savings, and commute stress have been the top reasons people seek flexible work. • Telecommuting specifically has grown 103 percent in the last ten years, and 37 percent of U.S. workers telecommute at least some of the time (up from 9 percent in 1995). • Nearly one in five workers currently work part-time in the U.S. By 2020, that figure is expected to rise to 40 percent. 77 percent of those part-time workers work part-time for non-economic reasons. • There are now 53 million freelancers in the U.S., compared to only 10.3 million freelancers in 2005. Companies of all sizes hiring for a range of positions and across a variety of industries are represented on the list. Medical & Health, HR & Staffing, Computer & IT, and Education & Training are the top industries featured on the FlexJobs 250 list but others such as Accounting & Finance, Government and Travel & Hospitality are also prevalent. “We know that people need work flexibility for all different reasons and come from all walks of life,” said Emma Plumb, Director of 1 Million for Work Flexibility. “They might be working parents, entrepreneurs, caretakers, digital nomads, people with disabilities, military spouses, students, environmentalists, or more. It’s extremely exciting to see not only the growth of flexible options in recent years, but also the breadth of opportunities across industries and job titles, reflecting the diverse backgrounds and wide variety of skills that these workers bring to the table,” said Plumb. 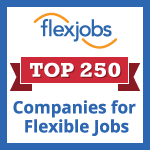 For more information about the FlexJobs 250 list, please visit https://www.flexjobs.com/blog/post/flexjobs-250-companies-with-the-most-flexible-jobs/ or contact Kathy Gardner at kgardner@flexjobs.com. FlexJobs is the leading online service for professionals seeking telecommuting, flexible schedule, part-time, and freelance jobs. With flexible job listings in over 50 career categories, and opportunities ranging from entry-level to executive and freelance to full-time, FlexJobs offers job seekers a safe, easy, and efficient way to find professional and legitimate flexible job listings. Having helped over two million people in their job searches, FlexJobs has appeared on CNN and Marketplace Money and in TIME, Forbes, Fortune, and hundreds of other trusted media outlets. FlexJobs’ Founder & CEO Sara Sutton Fell has also launched two additional partner sites, Remote.co and 1 Million for Work Flexibility, to help provide education and awareness about the viability and benefits of remote working and work flexibility. Sutton Fell is also the creator of The TRaD* Works Conference (*Telecommuting, Remote, & Distributed), dedicated to helping companies leverage the benefits of telecommuting, remote and distributed teams. 1 Million for Work Flexibility, a diverse coalition of companies, nonprofits, business leaders and individuals, is the first national initiative creating a collective voice in support of work flexibility. Follow on Twitter at @workflexibility and on Facebook at www.facebook.com/1MforWorkFlexibility. IT Pros, founded in 2011, is an award winning technology staffing and recruiting agency focused on delivering startups to multi-billion dollar large enterprises the hands-on technical talent needed for contract, contract-to-hire and full-time roles located in the United States. 2016 Awards: Best Technology Staffing Recruitment Agency, by CV Magazine | Best Employment Agency, by Philadelphia Award Program | Largest Business Networking Association in Philadelphia, by Philadelphia Business Journal | 100 Top Companies with Remote Jobs, by FlexJobs | Top 250 Companies with the Most Flexible Jobs, by FlexJobs.